If you’ve recently received military orders to move overseas, congratulations! While you may possess some mad PCS skills when it comes to preparation and organizing for a move, an OCONUS (Outside the Continental U.S.) move is an entirely different animal, exciting—yes!, bringing with it new concerns and challenges. Once the excitement of the news wears off a bit, there are a few things to pay attention to, especially if this is your first time moving outside the U.S.
Each OCONUS location has its own quirks, but the preparation for each also has many similarities. Our family has been lucky enough to experience four overseas tours in the Pacific and Europe, and here are a few things I think you should know before you go. 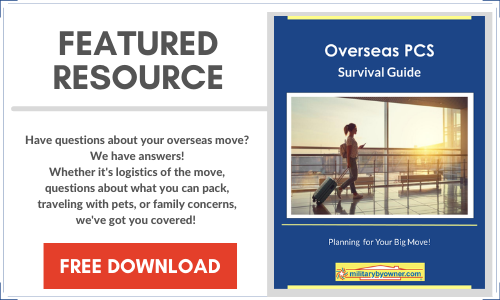 For more detailed information, be sure to download MilitaryByOwner’s latest ebook, Overseas PCS Survival Guide, designed to help you with every aspect of your overseas move! 1) As with anything military related, it’s all about the paperwork. Double check to make sure that every family member is listed on official orders, and names are spelled correctly. You’ll need that information in order to apply for the no-fee government passports required for PCS travel and all other paperwork. Check with the specific location to see if you’ll also need a visa. Schedule your overseas medical clearance ASAP, which you’ll need before travel can be arranged. The paperwork and appointments can be a headache, but the military has to ensure the overseas location is equipped to handle your family’s medical needs. 2) Make sure your U.S. driver’s license is up to date or not nearing expiration. You’ll probably need to test for a driver’s license overseas (for instance, the USAREUR license in Europe), but your stateside license must be valid in order to do so. Also note that you’ll need to carry both licenses when you drive overseas. You can get a licensing test guide ahead of time to study before you arrive. Remember to contact your insurance company to update your insurance policy and transfer your coverage overseas. On that note, you may wish to purchase additional roadside assistance once in country for a small fee, such as ADAC in Germany. 3) Get the real scoop on the area from your overseas sponsor. OCONUS housing is typically much smaller than what you’re used to, so begin downsizing and purging your belongings, and perhaps make plans to take advantage of the storage the military provides and stow larger items or things you can live without for the next few years. For instance, you may need to do without your oversized sectional sofa, large beds, or the table with 2 leaves and 12 chairs. Plus, you’ll want to leave room for finds from your future overseas shopping excursions! One unique aspect of an overseas move is that all of your boxes will be crated and sealed shut and require the sponsor’s signature. On the receiving end, it’s important to visually inspect each crate and seal before signing off and make note of any broken or cut tape for potential claims. Just like your family, your pets will need medical clearance before being approved for travel. Contact your veterinarian ASAP on receiving overseas orders. You’ll be required to ensure that all vaccinations are up to date and get your pet a health certificate for overseas moves within 10 days of leaving the country, so book this appointment early. Using a military vet for required paperwork is ideal, as they are well versed in what’s required. You’ll also need to check in with the Veterinary Treatment Facility at your new base on arrival. Some countries require dogs and cats to be quarantined for a certain amount of time—research this information ahead of time to avoid any unpleasant surprises. Overseas flights are long and your young ones may have never traveled by air for that length of time or even at all. Emotions from goodbyes may also be running high, so a little preparation will be key. Check out Dawn Smith’s post, Air Travel with Kids, for some great tips for traveling by plane with your kiddos. 8) Say bye-bye to your belongings. You may not see your household goods for some time—even months, depending on your housing situation. Pack with an eye to the upcoming season or ship a box of the next season’s clothes to your forwarding address so you’re not forced to spend money for items you already own. 9) Learn a few key phrases in the local language. Start off on the right foot with your new neighbors by learning ahead of time some simple greetings or commonplace phrases like ordering food. Download English to German, Spanish, Italian, or other langauge apps or carry a phrasebook with you. Attempting to communicate will go a long way and even if you're stumbling, locals will usually be pleased that you tried. Often, they will be able to speak some English and will try to help you out. 10) Connect! Make time to attend newcomers’ and inprocessing briefings. I know; you’re jetlagged, tired, and overwhelmed. However, the information will be invaluable and you can connect with real people in the know: school liaison officers, family and installation support services, and others like you who’ve also recently moved overseas. This will be a great way to connect and not feel so isolated—very important when you first arrive in a new country. Your installation’s Facebook group or website will also provide vital information and may help you make connections even before arrival. In the busyness of an OCONUS PCS move, it can be easy to forget what an incredible opportunity this experience is. Once the logistics of moving are behind you, it’s good to remember that, from the moment your feet touch the ground, you’re living a dream. Celebrate differences, try new foods, travel, be adventurous! Maybe you’ll be inspired to start your own travel blog or photo journal of all your new experiences. Whatever you do, I hope this will be your best move yet! For more information about overseas PCS, including budgeting for your move, what you're allowed to ship, military spouse employment overseas, moving with pets, and much more, click below to download the newest ebook from MilitaryByOwner, Overseas PCS Survival Guide.